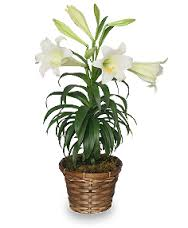 Easter wouldn’t be Easter without candy jelly beans, chocolate eggs, and the smell of the tall white Easter lily in my mother’s dining room. 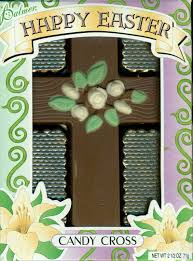 For the majority of kids in my family, while my Grandma Kelly was alive, we would get chocolate from her on Easter. 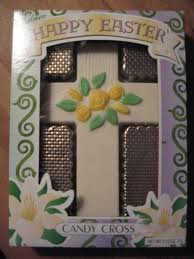 To be specific, chocolate crosses would come piled 6 or 7 high in a brown paper shopping bag. Some were white chocolate and some milk chocolate. The small cardboard boxes held a cellophane tray that, as it slid out of the box, would make a great crinkling noise. My preference was milk chocolate, while Sue and Judy liked the white chocolate variety. At some point in our childhood my brother Billy was diagnosed with an allergy to wheat; long before celiac was the more commonly known allergy. Basically, it meant that he wasn’t supposed to have chocolate even at Easter. What’s a grandma to do? Well, Grandma Kelly was a pretty smart lady. She found a treat that she thought Billy would like. A small white paper bag containing sugar-coated, fruity flavored jellied slices was included in the brown bag with the crosses. As you can imagine with that many kids in the house and Easter baskets left on the hutch in the dining room, we would pilfer each other’s baskets (and to any of my siblings reading this post, you know we did, so you can’t deny it!). I’ll be honest, then I liked those better than the chocolate and would sometimes sneak one or two out of his basket when he wasn’t home; and I’m sure he got his fair share of chocolate out of my basket. The Best Of This Year’s Peep’s Diorama Contest! How Fast Will You Eat Your Easter Candy? As a kid, Easter WAS candy – particularly chocolate bunnies! Oh, yeah, and those marshmallow peeps!